Whatever can be said about Harry is probably an understatement. 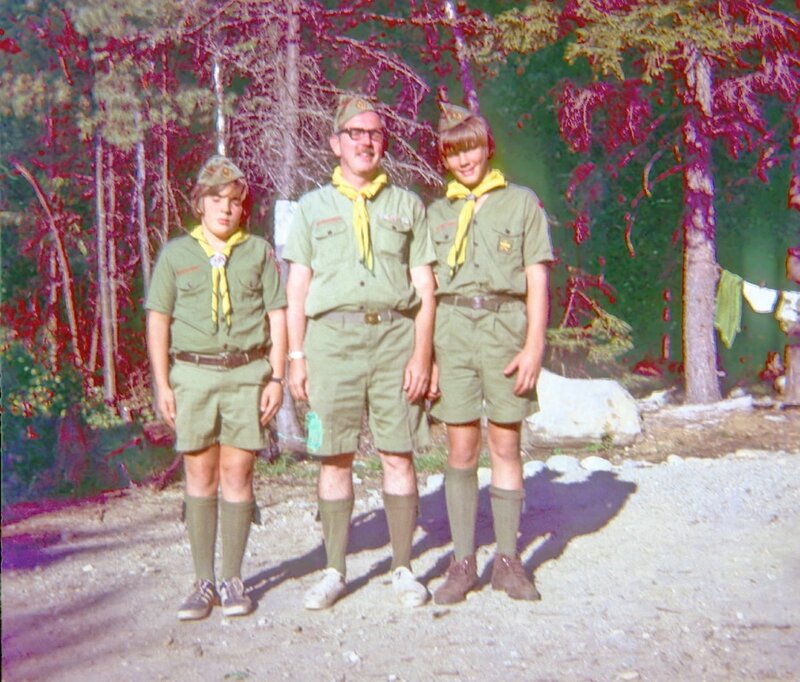 Scoutmaster of Troop 25 from 1848 to 1988, Harry was focused and passionate about everything he did, always in motion with energy that made him last to bed and first up. Center Church Youth Leader, on Conservation Commissions and the Board of the Lutz Museum, even led the Young Republicans earlier. He was a War Veteran with a Loomis and Yale education and background with Camp Pioneer. He walked faster, yelled louder and knew more about so many topics than the rest of us. In an era that fronted adult formality, he was ‘Harry’ instead of Mr. Maidment. He connected with his scouts, cursed creatively, knew so many songs and played multiple instruments, spoke several languages and shared his life so often with us-- when he could have been successful in so many other callings. He provided a credibility with those younger so that he was approachable on any topic or question we hesitated to ask any other adults. He was the one you sought when overwhelmed with serious trouble. He could explode upon you with a poke, push, a cuff with an indictment (often including quoting of Scripture) of some wrong both of you knew you were guilty of. He had the implied confidence that your parents would not question but would support his methods. He had the rather rare ability to compartmentalize his wrath, was not prone to hold grudges or stew on your past guilts and would restore you to good status quickly. He had the arrogance to call people during their dinnertimes ‘because that is when you catch them at home’. He forged his path strewn with obstacles (‘no one else has ever ……’) when so many other courses would have been safer or easier (but without the results he was looking for). He had faith in young men and gave opportunities to lead when others would have seen them as poor risks at their age. Whatever task he charged you with, he always followed it up expecting you to have completed it, or pay the tirade. John Bowen became his closest friend, and once remarked to me ‘Like all Great Men, Harry is full of himself.’ If he took a position that might be seriously questioned, he knew if he hinted that he would resign, the opposition would melt and he would get his way. He wrote his Master’s Thesis on running a scout troop, and put into place a hierarchy that could insulate him from controversy yet still give him ultimate clout with a singular purpose. His qualities drew in an inner circle of talented men that moved his ideas forward, found solutions to problems, frustrated and sparred with him on issues and provided such a cohesive force to accomplish what the Troop has. He did not just choose his own direction for Summer Camps. 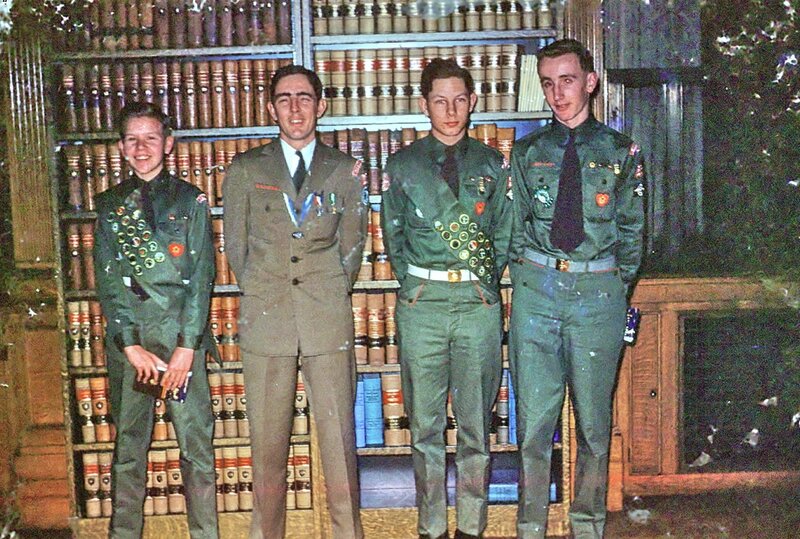 In the 1970s, he pulled Troop 25 out of District Camporee competition. He pooled together a number of disgruntled troops to form their own invitational, and for a number of years it was run on a smaller, more efficient style with Harry's leadership stamp all over it. He shopped at A&P for Tudor Beer and made known his house was rather always open for staff. After Wednesday meetings, at his house or rotating with others, was a Staff Meeting to reflect, muse and project on a variety of topics. His was a life that counted, and when asked about it he quoted Sir Christopher Wren. 'If You Seek My Monument, Look Among You.' So many of us continue as these monuments. 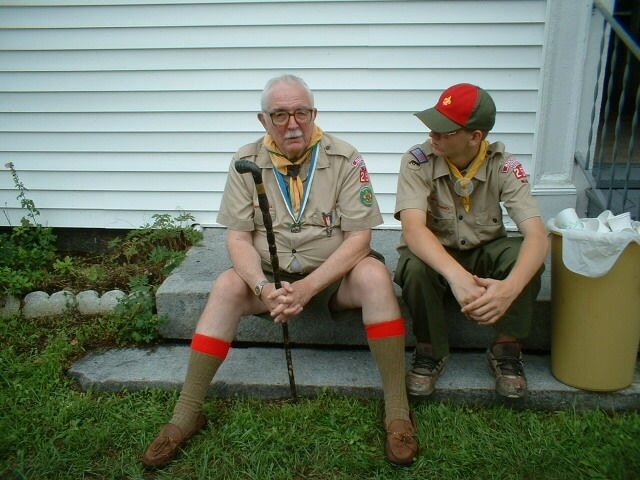 ​Harry's longevity, forty years as Scoutmaster kept his drive far past when others would have stopped. When he decided 'I Yield to Youth', our continued good fortune was to have it placed in the very capable arms of Paul and David. This builder of empires quietly wanted to 'just count dominos' and spent the remaining time as the Grandfather image. Those only knowing him at that stage need to find about the Harry we had known, the strong image of the vibrant, vigorous force that seemed everywhere and actually was. If you are interesting in learning more about Boy Scout Troop 25, click the button below to complete the inquiry form and a leader will contact you.